This is a recipe I pulled together when all I had at the time were two eggplants and a loaf of roasted garlic Tuscan Ciabatta bread. I wanted something light but with amazing flavor. Most anything you put on top of a slice of grilled or toasted Ciabatta is delicious. I found myself staring at the bread, then staring at the eggplant. OMG, Roasted Eggplant Tapenade! Garnish with smoked ground Paprika and E.V.O.O. I cut the top off two eggplants. Then cut them in half lengthwise and laid them onto two baking sheets. Drizzled them with olive oil, Kosher salt, and freshly cracked black pepper. Roasted them for 35-40 minutes then let them cool. Scoop out all the flesh and transfer to a food processor. Add the Cannellini beans, lemon zest, lemon juice, garlic, spices, Kosher salt, black pepper and *e.v.o.o.. Pulse until smooth. Next, add the grated cheese, fresh chopped herbs, and pulse until combined. Transfer the Tapenade to a serving bowl. Preheat oven 375 degrees F. Slice bread into 1/2 inch thick slices. Place them onto a baking sheet. Drizzle each slice with a little olive oil. Sprinkle each slice with a pinch of Kosher salt and black pepper. Bake for approximately 12-15 minutes or until the bread is golden brown. 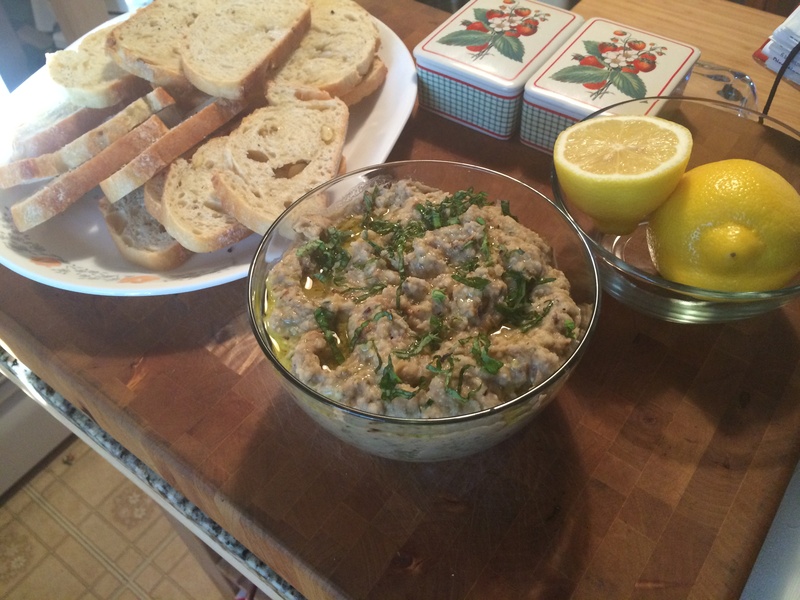 Place the Roasted Eggplant Tapenade in a serving bowl. Sprinkle ground smoked paprika and a drizzle of *E.V.O.O. over the top. Alongside, I serve a platter of sliced grilled or oven toasted Ciabatta bread.